Acrylic base with white acrylic lens. Uses 1-60W medium base bulb (not included). 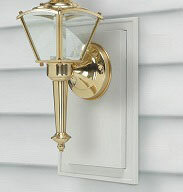 Dimensions: 5"W x 8-1/8"H x 5-3/4"E. Finish: Polished Brass. Shade Description: Clear Glass. Fixture Material: Metal/Glass. Uses (1) 60-Watt E27 Base Lamp. Bulb Included: No. Voltage: 120. Socket Wire: AWM 3321, 18AWG, 600V, 150°C. Certification: UL/CUL Listed. Application: Suitable for Wet Locations. Wire Nuts: Included. Black die-cast powder coated aluminum. 4"W x 8-3/4"H x 5-3/4" extension. Black finish with 5 mm clear glass. 1-60W max medium base bulb. (not included). Die-cast aluminum fixture. Clear, beveled glass sides. 6"W x 16-3/4"H, projects 6-1/2". Uses one-100W medium base bulb (not included). 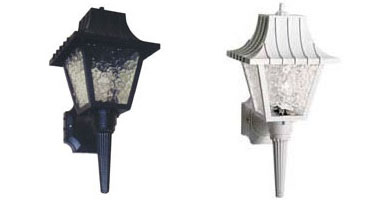 Height: 17-1/2", Projection: 8-1/2", Mounting Base: 4-3/4". Bulbs: One 60W (not included). White frame with frosted glass. 6"W x 8-1/2"H x 7"D extension. Uses one 60W (M) bulb.